Single-use plastics are used only once before they are thrown out or recycled. In recent years, cities from all over the world have began imposing restrictions on them. It started out with plastic grocery bags. And now, the campaign for reducing plastic waste has led to the ban of other single-use plastics like straws, coffee stirrers, and utensils. 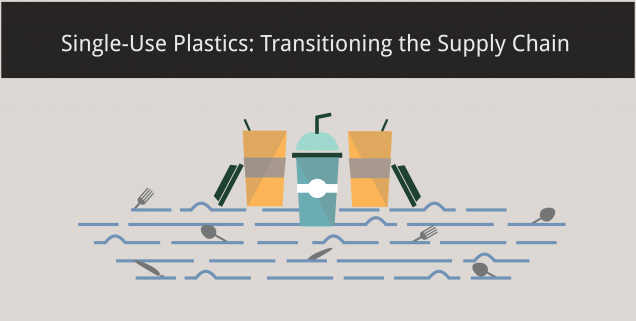 To comply, companies like Starbucks, McDonald’s, and Disney have unveiled plans to phase out their non-recyclable plastics. They are turning to options like compostable lids and bamboo or paper straws. Although many companies have said they will remove single-use plastics from their stores within a few years, many have not specified their intended alternatives yet. However, there are currently various solutions being developed in the market. From fully biodegradable plastic straws, to bioplastic solutions that you can eat, businesses have a number of environmentally friendly options available to incorporate into their supply chain. So what does this mean for supply chain management? Have these companies analyzed the costs associated with making drastic supply changes? What are the implications of sustainable manufacturing? How can these companies equip themselves to face fall-outs? Whether you are a large corporation or a small business, here are a few crucial points to consider before transforming any portion of your production chain. Utilizing advanced supply chain software, you can get an overview of your entire supply chain. See data from broad view production practices, down to the granular details of all the moving parts. If reducing the amount of plastic in your supply chain is the goal, then being able to identify product packaging attributes would be helpful. Note the current costs of production so you can project an estimated cost difference with your proposed procurement changes. Over 42% of all plastic produced in the world goes into the plastic packaging of goods. Thus, investing in sustainable packaging solutions has the potential to make a huge impact in plastic waste reduction. Conduct research into alternative packaging methods and implement the changes efficiently. As industries continue to embrace green solutions, there are an increasing amount of alternatives entering the market. Paper and pulp packaging or thinner recyclable plastic are just some of the options available. Working hand in hand with data analytics, businesses need to make decisions quickly if they want to minimize costs and maximize profits. Want to reduce plastic usage? Set up target stages so you can track milestones. You can aim to reduce plastic usage by 5% by the end of 2020. Having real-time inventory automation allows you take action faster. When introducing changes to your supply chain, take advantage of the technologies available so that production can carry on smoothly. From the above points, you should be able to account for changes in supply and demand, minimize fluctuations in costs and revenues, and be prepared to face unavoidable setbacks. While you should integrate technology into the logistics of your supply chain, it is equally important to ensure your supply chain is agile and adaptive to changing situations. For instance, dual sourcing your supplies can prevent stock-outs. Establishing a network of warehouses and fulfillment sites can help to mitigate other setbacks that arise. Visibility is key to a flexible supply chain. With current cloud-based software fully equipped with tracking and tracing, billing and analytics, and warehouse management, overall efficiency is improved and the supply chain can afford to handle changes and improvements. Whether you are a large corporation or a small enterprise, making sustainable changes can benefit the environment and your business. Maybe it’s phasing out single-use plastics like these companies. Despite the upfront costs, your brand value improves and you can significantly decrease expenses in the long-run. With the appropriate warehousing solutions in place that allow for effective forecasting and inventory management, more and more businesses are able to ensure smooth operations while transitioning to a sustainable supply chain. Can Your Supply Chain Benefit from Lean Thinking? Infographics Series: So you want to Manage your Inventory ?